It has become apparent that federal, provincial, and territorial governments are focussing efforts on improving First Nation and Inuit infrastructure. Over the last number of years, Parkin has had the opportunity to build a strong northern portfolio. The work includes four schools, an RCMP police facility, two healthcare centres, and a correctional facility—all of them located within the arctic or northern boreal regions. The work has been challenging in terms of dealing with harsh environmental and socioeconomic conditions, rewarding in terms of being able to help support communities and the country, and humbling in terms of the lessons learned while working with our indigenous partners. Our first northern projects were delivered with the intent of delivering “southern” solutions to the North. With time, experience, and a better understanding of our North, we now find ourselves in a position where we are applying indigenous solutions to our southern work. A disturbing trend in the south sees schools increasingly becoming zones of refuge. Exterior doors are locked during the day, police are becoming a regular feature in the hallways, and “suspicious” people are avoided. Unfortunately, the “outside community” is excluded from the learning process, often as a result of safety concerns. This approach to teaching is very much at odds with the northern experience, where harsh environment necessitated that groups and individuals traditionally shared all aspects of life, including education. Our northern work has reminded us of the fact that all members of society are part of a community, where collaboration and the sharing of knowledge are fundamental to social strength and evolution. Far from being shunned, outside adults and elders are encouraged to enter the schools with the intent of sharing their knowledge, much of which is not part of a curriculum that is more typically focused on academic achievement. Architecturally, a good example of encouraging community involvement is the inclusion of a “kiva” space within the heart of the school. 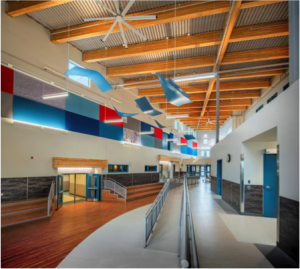 The recently opened Tuugaluuk high school in Naajuut, Nunavut features a large, well-lit communal area that is formed at the interstitial node between classrooms and large support spaces. The kiva is the first space that community members encounter when entering the school. Taking advantage of the undulating landscape, the kiva descends towards the Arctic Ocean and is orientated to welcome the first rays of the winter solstice. Fixed bench-like seating, stairs and ramps all contribute to a space, which allows for impromptu gatherings, teaching and socialization. Located off the gym and a kitchen, the Kiva welcomes community members to become part of the sharing environment. Tuugaluuk is more than just a school—it is a place of learning. Parkin’s northern work has focused on ensuing that that these principles are respected and celebrated through the use of appropriate materials and their sensitive placement. Just as LEED principles have infused themselves into the vernacular of most architects today, the continual application of the grounded and universal principles of IQ have increasingly become manifest in Parkin’s southern work. When exploring the history of building in the arctic, one finds that there was a common theme among southern architects to deliver prefabricated units that did their utmost to insulate the users from the elements outside. Windows were small, entrances were hard to find, and volumes were often bulky. “Visionary” structures destined for the Moon or Mars found themselves in Iqaluit and Igloolik. There was a belief that building containment should increase, the further one ventured into the North, due to extreme weather. Our experience of working in the North is just the opposite. Creating spaces that separate individuals from their environment is contrary to a consciousness that is defined by the outdoors. While large windows and large spaces help to animate daily internal life, we have found that it is important to actually provide opportunities for students, patients and sentenced convicts to partake in exterior activities. Recognition of this reality has resulted in more-focussed attention spans and reduced stress levels. The recent “discovery” of the two Franklin expeditionary ships in arctic waters has been rightfully considered a great achievement. What is even more remarkable is the fact that local Inuk residents already knew of the locations. Asked why they did not share their knowledge, the response was that did not think that southern people would believe them, that their advice is rarely sought, and they did not trust the recipients of the knowledge. Canadian indigenous societies were oral societies. Information was passed by word of mouth, constant repetition and consensus-building. Listening and sharing were intrinsic to creating understanding and acceptance—and still are, even today. Design meetings in the North require significantly more time than those in the South, as building trust is intrinsic to a building’s acceptance and subsequent usage. Student retention rates in the North have been generally poor. Some attribute that fact to the reality that southern pedagogy is not relevant in a society where southern-type jobs are few and far between. Simply put, many students are bored due the tedium of homework and memorizing conjugations. There is a growing realization that northern curricula should be tailored to societal norms as opposed to the opposite relationship. The ability to teach animal skinning, workshops that allow for the creation of Komatiks (sleds), and daycares that allow young mothers to stay in high school, are all spaces (in addition to science labs and regular classrooms) that recognize local needs over abstract norms. The lack of standardization, less testing, less homework and more participation in hands-on activities, is an approach that is more similar to the successful Finnish education model than to the typical North American model. Parkin is aware that there is no retreat from the realities of stringent budgets and stringent codes that are part-and-parcel of any project in Canada. Having been given the opportunity to practise our trade in the North, and having been given the opportunity to listen to numerous community members, we have been reminded that we are ultimately required to produce places of celebration, irrespective of whether they are places of learning, living, or healing.